Black Friday, the day after Thanksgiving, has marked the start of the Christmas shopping season since 1932 in the United States. Though the concept has its origins firmly in the US, retailers worldwide have embraced the day and there are some fantastic bargains to be had not only on Black Friday, but for the entire week leading up to it, as well as on Cyber Monday. Standing outside a department store from the wee hours, to be the first in the door when it opens hours later, avoiding being trampled and grabbing the first widescreen TV I lay eyes on is, quite frankly, my idea of hell on earth. Luckily, lots of retailers are offering great deals online so you can browse from the comfort of your own couch. I had a look at Amazon UK* to find some of the best deals for geocachers to snap up. The online shopping giant has great deals in almost every department until midnight on Black Friday. If you were planning on spending next summer kayaking to grab a series of T5 caches but haven’t yet bought the right equipment, this is the perfect deal for you. With a whopping 56% off, it costs just £80.05, includes free UK delivery and it’s earned a 4.5 star rating from Amazon shoppers. I am a big fan of Sharpies but they don’t come cheap, so this Black Friday deal of up to 60% across the range should be snapped up! This set of ultra fine point markers – perfect for nano logbooks – is just £5.50, down 56% from the RRP of £12.49. Power packs are fast becoming a staple of the geocacher’s tool kit. Powerful and reliable packs can be pricey so grab this one from EC Technology for just £16.99, a 43% discount. This is one of the battery packs I own and it will charge my iPhone 6S about 5 times before needing to be recharged. For a smaller alternative (or in addition to the above), this dainty little pack from Aukey is currently just £6.59 – that’s a 34% saving! I have just bought one of these for myself as I’ve been borrowing the muggle’s to bring with me when I’m out geocaching. I really like how it fits easily in my pocket without weighing me down. Multi-tools are a handy piece of kit not just for geocaching, but to have with you during any type of outdoor pursuit. This Leatherman version might seem pricey at £69.99 (a 29% reduction), but it comes with a lifetime guarantee and a plethora of rave reviews. … like me! I don’t have the luxury of easily reaching those caches placed high up, so I either need to cache with someone tall or bring a prop. I currently have a kid’s plastic step from IKEA to help – which it has done several times in the past – but this foldaway step would give me twice the height and pack away quite nicely in the boot. It’s currently priced at £37.49, a 42% saving. There are some great deals on walking shoes and boots, with around 50% off some top brands. I love Karrimor and these Men’s Calgary Weathertite Hiking Boots certainly look nice and warm. For just £41.99, you’ll save a massive 53% ! If I hadn’t already bought two new pairs of Karrimor boots just a few months ago, I would be adding these to my virtual shopping basket immediately. They look so cosy and are 57% off for Black Friday – just £38.99! If you were thinking of upgrading your GPSr, make sure to check out the deals that Amazon has this week. At the moment, there is 22% off the Garmin Oregon 600, with a current price of £249.86. For £325, you can get the Oregon 650T featuring an 8MP Camera – how cool! This price is a saving of 26% over the normal retail price. These are just a few of the thousands of Black Friday offers that Amazon currently has on their site. If you are looking for something in particular, it pays to check their Lightening Deals, available for a limited number of customers (first come, first served) and only live on the site for a certain amount of time, as the name suggests. 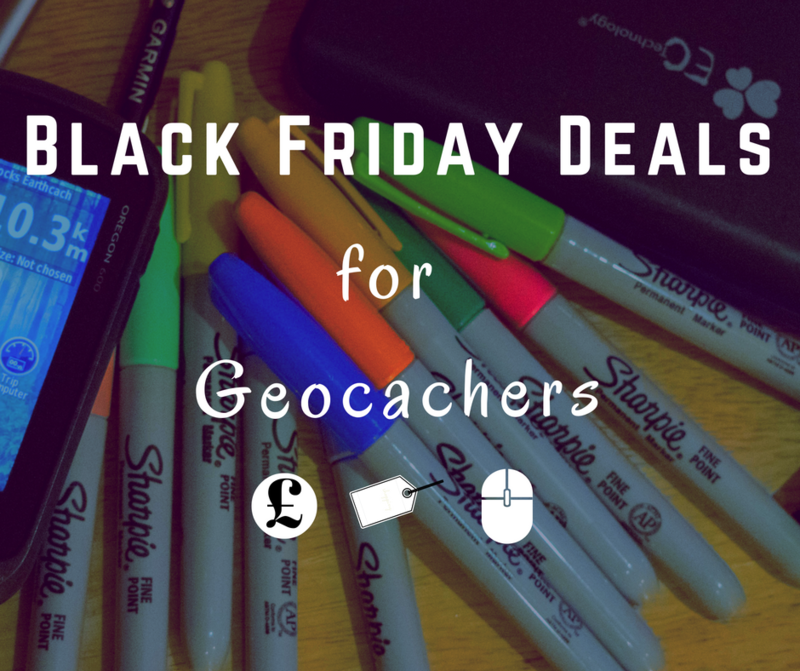 Have you found any great Black Friday deals for geocachers? Let me know in the comments!